Here’s a wonderful, upscale recipe that is lovely for Christmas Day or New Year’s Eve. The editors at Gourmet magazine once said this simple roast was one of the best they had ever tasted. It is “cured” in the same way that fresh salmon is for gravlax, literally buried in a mixture of coarse salt, sugar, fresh dill and cracked black pepper. It is radically simple to prepare and radically delicious served with a silky potato puree and roasted winter vegetables. Open a bottle of full-bodied red burgundy or syrah. The next day: Serve the world’s best roast beef sandwiches topped with a horseradish sauce made from crème fraîche, white horseradish, and a splash of sherry. 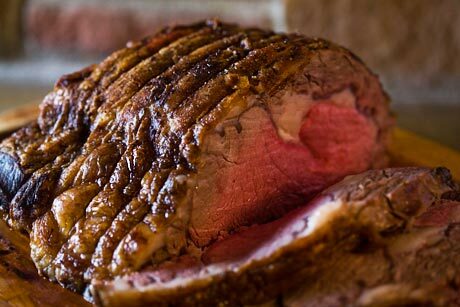 Several readers requested the recipe for the Rib-Eye Roast mentioned in yesterday’s Hanukkah blog. 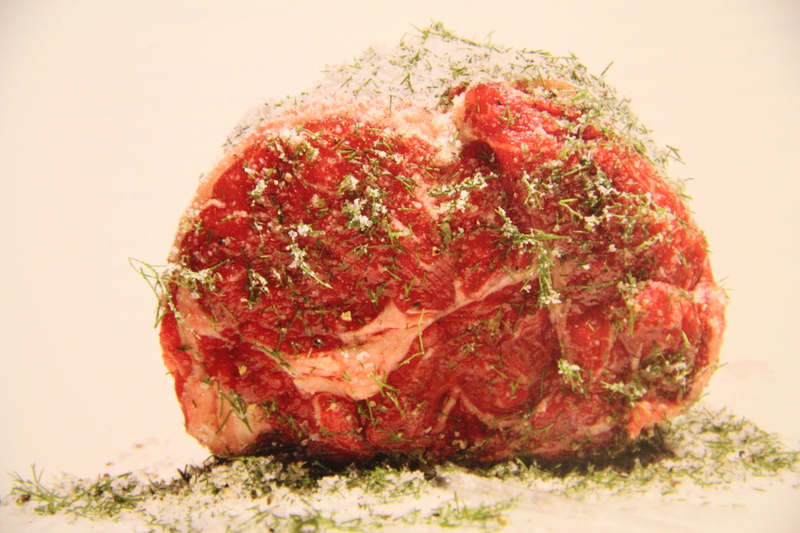 The editors at Gourmet magazine, where the recipe first appeared, had this to say about that…”A wonderfully salty exterior and a hint of dill make this easy-to-prepare roast one of the best we’ve ever tasted.” I’m not sure how this idea first came to me, to “cure” a hunk of raw beef in the same way you would cure a tranche of salmon, gravlax-style. What was I thinking? Perhaps I imagined a kind of carpaccio that could be sliced paper-thin and served raw. But I nixed that idea and decided to roast the meat instead: the method produced very juicy, vibrant red flesh with a slightly caramelized, herbaceous crust. And it is stunningly simple to make. The most difficult part of this recipe, it seems, is to get the right piece of meat. In the Gourmet recipe I used a rib-eye roast that had plenty of marbling. Retooled for Radically Simple (11 years later), I used a boneless rib roast. No one in my neighborhood seemed able to accommodate my request for a 3-1/2 pound rib-eye, rolled and tied. Whichever cut you find, however, will yield great results. Gravlax, a Scandanavian preparation usually meant for salmon, literally means “buried” in a mixture of coarse salt, sugar, fresh dill, and cracked black pepper. According to the Oxford Companion of Food, the preparation can be traced back to 1348. The salmon is wrapped in plastic and weighted down for a period of 24 hours to three days. Not only does the flavor get absorbed but the texture is altered as most of the inherent liquid is released to become a kind of brine. I apply exactly the same method to the meat. With gravlax, the salmon is served uncooked. In my recipe, the beef is roasted at 400 degrees for approximately 1-1/4 hours at which time perfection is achieved. Start your prep one day in advance and make sure the meat is at room temperature before you cook it. You might want to try it during one of the remaining nights of Hanukkah because it is delicious with latkes.